JeepForum.com > General > General Discussion > Rubicon advice!! Ok I’m not a complete dummy, but I’m looking for quick references more or less. I’m currently got my eyes on a super clean 03 rubicon. Obviously I know dana 44’s are a clue, but are there any other advice of things I can go over? I wanna basically make sure this rubicon isn’t gutted. What came standard on rubicon etc. Any input is much appreciated. VIN reads as a rubicon. But I haven’t laid my eyes on it as it is 2 hours away. I just want to go prepared. There's a thread in the TJ tech forum with all the specs. IIRC there is another thread in TJ tech about the best years, and many an opinion consider the '03 one of the best TJ years to find. Rubi even better. Aside from the axles, the RockTrac 4-1 TC. Awesome! I really appreciate this. Let’s say everything checks out .....Price?? What’s good and bad. I know what kbb says but I wanna hear yours guys opinions. I usually cruise the for sale forum and craigslist and POR to try to get an average... then go from there. Of course mileage and condition is key. Ok guys check this. Update on this rubicon. This rear look bent or is it just an illusion. But someone’s been in there from the obvious red sealant. And the pass tube looks wet. Too hard to tell from the pic. Could always take a buddy along and pull a string on the axle. The red gasket sealant just means the oil was changed at the least. Talk to the owner. Pull the plug and stick your pinky in there and check the oil. The oil on the tube could be from earlier leaks... hard to say. If there are no drips and it is minutely slow, then doesn't sound that critical. 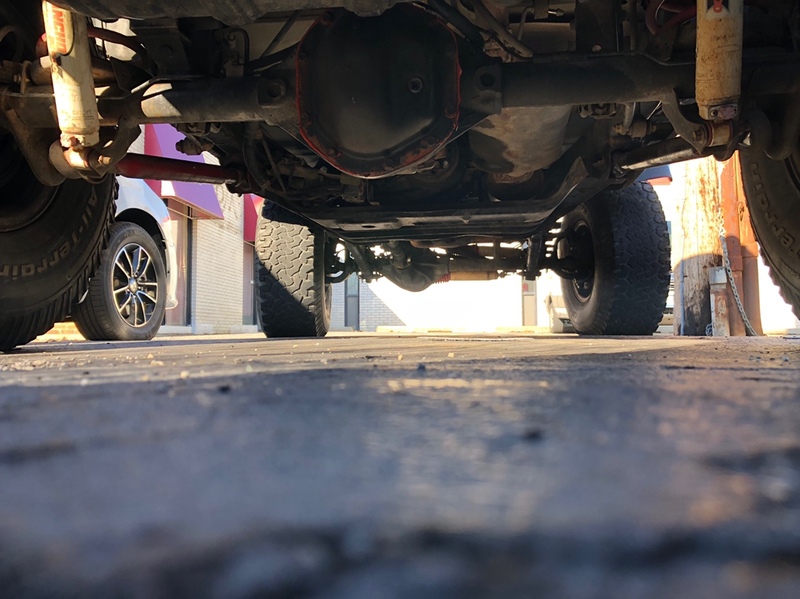 If you feel the axle is straight and you decide to buy it you can always weld the tubes and that would take care of any 'minor' leak if there is one.